As Web Usage Increases, the Internet Experiences a Personality Shift from Educator to Entertainer and Advertisers Take Notice. As of April 2010, approximately 83% of the US Population between the ages of 18 – 54 years old was using the internet (Pew Internet & American Life Project). A recent study released by Edelman suggests that people’s perception of the Internet as the Information Superhighway is quickly fading. People now cite the Internet as the second most popular entertainment medium, reflecting the impact of the wide adoption of Social Media and Online Video. While 58% of people still count Television as their number one source of entertainment, the Internet is second at 28%, followed by Movies, Radio and Music/CDs. More than 50% of respondents said they consider Social Media as entertainment - And more than 53% of all internet users participate in some form of Social Media activity daily (Pew). Content is still King, but it’s not necessarily high-end, slickly-produced video, images or music that capture the bulk of people’s leisure time (and some of their at-work and commute time as well). YouTube is now the second busiest Search Engine and visitors to the site view more than 2 billion videos a day (YouTube). Some of these videos may indeed include educational content, but many (I’d dare to say the far majority) are for pure entertainment purposes alone. Advertisers are reacting to this shift in media consumption. Where the Internet was once seen as a place for the educated and young to gather information and research, it has now become a window to an escapist reality and is available to and utilized by most everyone. 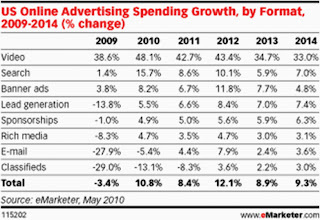 Advertising dollars are moving from more traditional Radio and Print, and slowly from Television, channels to online Display, Search and Social Media; 69% of advertisers are focusing more on Digital in 2010 than in 2009. eMarketer is reporting that US Internet ad spending will grow by close to 11% in 2010. 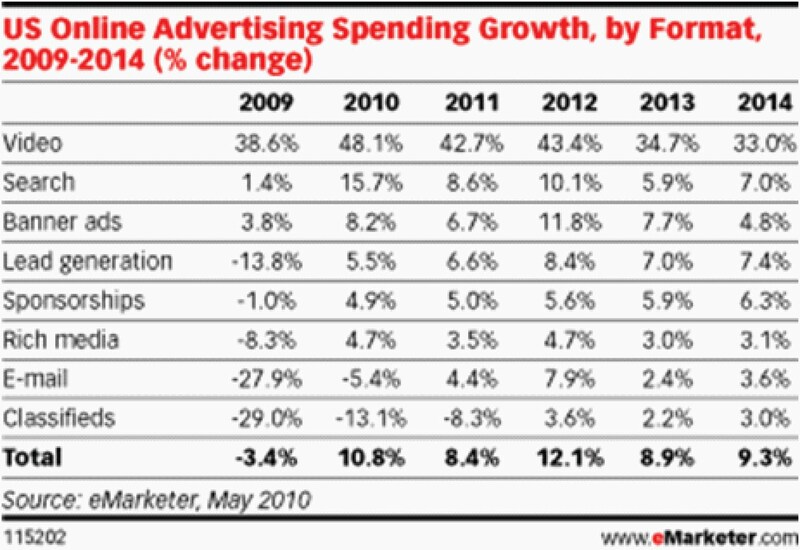 Video and Search advertising are predicted to return the strongest growth followed by Online Display (Banner ads). As consumers move fluidly across TV, Desktop, Mobile Device and Tablet while searching for their entertainment, it is imperative for Advertisers to strategically plan their media and messaging across channels and to be platform agnostic. Integration both in format (of ad and content) and message is important as consumers retain more control of ad delivery and can chose whether or not to engage with, or to promote, a Brand. Savvy consumers can quickly take down an intrusive or offensive ad campaign as easily as they can promote it beyond the reach, frequency, impressions or clicks purchased by the advertiser, with the use of Social Media. Smart planning, execution and measurement are critical to advertising success and an integrated media strategy sets the framework.